This book tells a very beautiful and magnificent adventure, that of a young Frenchman humiliated by the 1940 defeat who fled aboard a Breton crayfish boat to carry on the fight for freedom. This book tells a very beautiful and magnificent adventure, that of a young Frenchman humiliated by the 1940 defeat who fled aboard a Breton crayfish boat to carry on the fight for freedom. 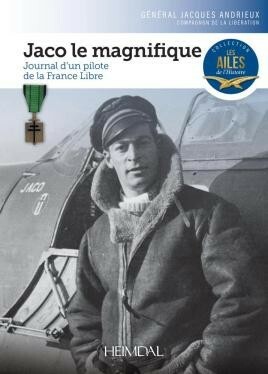 The diary of Jacques "Jaco” Andrieux tells very simply, quickly and always with emotion, the discoveries, the apprenticeship and the daily life of a Free Frenchman transplanted to England, in Fighter command. The unceasing combats he fought in the RAF squadrons, the risks, the kills, the loneliness of the hunter, the camaraderie, the fraternity, life, are all written in a simple tone, lively and effective with the impression of being in the heart of the action. Each page breathes its lot of pictures, sounds, smells but also the feelings, doubts, joys where death and life exist alongside each other simply. General Andrieux relates his combats above the Channel, Dieppe, the Normandy Landings, and in the skies of France which was being freed and above Germany in its death throes. The story of this man is part of History itself. This tale full of panache is breathtaking through and through with the breath of life, that of the Magnificent Jaco.